One of the most important avenues of the modern world is a mean of communication. There are endless options one can go for in this era for easy communication, but some of the options are time-consuming while some are really quick. One can go for an option as per own need and requirement. The advancement in communication technology and the development of software has led to a lot of changes in society. The fundamental need for healthcare by every human is now developed and armed to treat every kind of disease in a better manner. For finding a cure pharmaceutical companies are required to understand the structure of viruses and bacteria that cause the disease. Once the structure is known its vulnerability can be understood, and a cure can be developed. But is the process to understand the structure of bacteria easy? No, biologists have to be accurate and precise while developing a drug because a small mistake can cost the lives of many people. To find a cure is a job full of responsibility and until now it was difficult but not anymore. Enter, Virtual Reality. Wait this is not gaming so is VR going to help in health care. Medicine companies need to experiment the drug before launching it into the infected area. The results of the experiment determine how effective the drug is. It is a common method to test the drug on animals which have similar organ behaviour to humans, but it is equally important to know that the drug would not have a negative impact on human health. The drug experimentation on humans is banned by almost all the countries across the globe. VR at the rescue in this situation, a company, can simulate the organ structure and DNA structure and then digitally determine the effects of the drug on the organ and human body. Hence implementation of VR can save the lives of humans and animals even before the drug reaches the market. 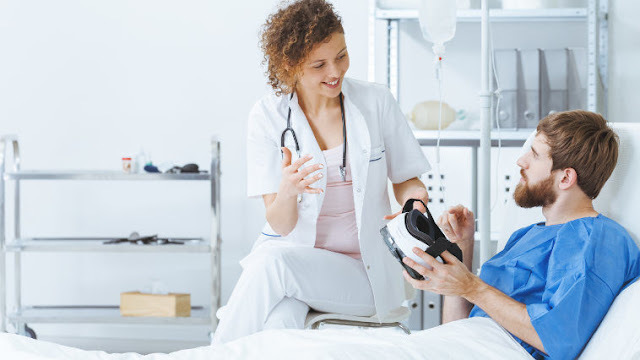 Virtual Reality companies in healthcare make sure that the VR designed provides accurate help as and when required. To win a doctor's faith in prescribing a company's medicine is extremely difficult. One wrong case can ruin the medicinal expert's career and can cost the life of a human being. It is equally important that the doctor understands how medicine is going to work. Virtual Reality at the rescue again, a VR presentation simplifies the working of a drug for presentation purpose as well. The simulated data can help a doctor understand and decide if the medicine is the right choice for his patients. Virtual Reality healthcare companies are in the market for accurate analysis and accurate solutions for both the manufacturer and the doctor. Virtual Reality makes one experiment with the medicine structure before the outcome as many times as it is required. In addition to that, the data can be stored in the form of animated videos which helps with accurate understanding.